Blue-green algae can be either toxin producing or non-toxin producing, depending on the type of blue-green algae. However, you can't tell whether blue-green algae is toxin producing just by looking at it. Consuming water containing toxin-producing blue-green algae can make you sick, as can consuming blue-green algae supplements that contain toxins. Blue-green algae grows in freshwater that is slow moving, including ponds and lakes. Avoid contact with water containing this type of algae to limit your risk of illness. Depending on the type of toxin produced by the algae, you could get ill from inhaling, swallowing or touching water containing these algae. You should not swim in this water, or use it for drinking, cooking or bathing, according to the Florida Department of Environmental Protection. Blue-green algae supplements, such as spirulina and chlorella, can be contaminated with toxins called mycotoxins, harmful bacteria and heavy metals like lead. A study published in May 2000 in "Environmental Health Perspectives" found that 85 of 87 samples of blue-green algae supplements tested contained mycocystins, which are toxic to the liver. Choose supplements from a reputable manufacturer to limit this risk. Blue-green algae can produce a variety of toxins, including those that affect the skin, the brain, the digestive system and the liver as well as other organs. These can cause side effects and illnesses including itchy skin, diarrhea, headache, fever, asthma, vomiting, respiratory failure, seizures, heart attacks, paralysis, DNA damage and liver cancer. Effects are usually worse when you ingest a large amount of these toxins. Children are more likely to be affected than adults because of their smaller size and their propensity to drink the water when they are swimming, either accidentally or on purpose. 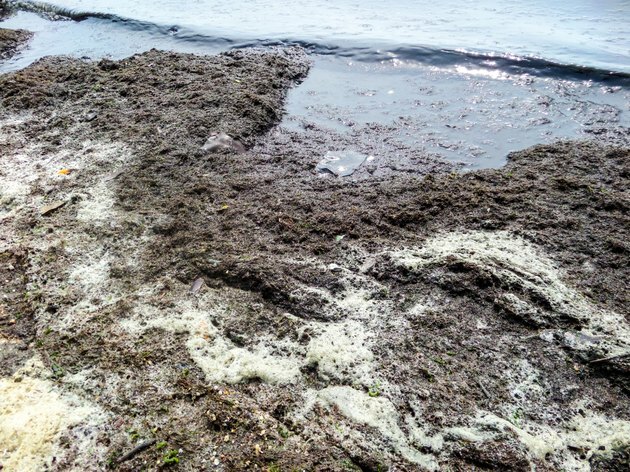 To avoid becoming sick from blue-green algae, avoid contact with this type of algae. Boiling the water or treating it with chemicals will not get rid of the toxins. After swimming or coming into contact with pond or lake water, bathe with fresh water and soap to get rid of any algae on your skin. Take measures to prevent blue-green algae blooms in the waters near you, including using less fertilizer and only using fertilizer and cleaning products that do not contain phosphorus, properly maintaining septic systems, maintaining native plants around bodies of water and limiting activities that can increase erosion.